So the old man is to return and drive a Ferrari again - news as surprising as BMW's withdrawal but rather more welcome. That view may be unexpected, coming from someone who has never liked Michael Schumacher but time has mellowed my opinion and now I can admit that it is a brave decision on his part. He must know how risky for his reputation is a comeback at his age. The adoring hordes of Schumacher fans will expect him to win from the outset and even the more realistic F1 watchers will presume that the veteran is still capable of showing the young upstarts a thing or two over the course of the next few races. Which brings to my mind Michael's somewhat liberal interpretation of the sporting rules and a doubt that the stewards would be as understanding nowadays. So much has changed in the years that Michael has been away. Yet, if anyone can and will prepare himself to the utmost for the challenge, it is Michael Schumacher. I admit that my respect for him has gone up a notch in view of his acceptance of the task; clearly, he is not as concerned for his reputation as is his former manager, Willi Weber, who advised him to turn down the offer. The man just cannot resist a chance to compete. Commentators are remembering other veterans who returned to F1 for a second crack at the game, wondering whether these might give an insight into Michael's chances. Yet the circumstances in Lauda's, Prost's and Mansell's return were very different and none of them were as complete a driver as Michael. Lauda came back for money (his airline was struggling financially at the time) and found himself in the best car and with a team mate (Prost) who seemed to have most of the bad luck going in that year. His championship came by virtue of half a point and the following year showed the true difference in skills between Niki and Prost. Prost's return to the game happened after only a year's sabbatical and he jumped straight into a car so much better than the rest that he would have looked stupid had he not won the championship that year. His retirement at that point may have been a recognition of how lucky he had been, apart from the threat of Senna joining the team. And Mansell made a mistake typical of a man who always overestimated his own talents. Without the benefit of the best car, he was never going to live up to his reputation. Like Lauda, Michael returns after a long absence but not to the best car in the field. One might think he runs the risk of emulating Mansell in this but the Shoe's talent was (and presumably remains) so much greater that he will do far better. At the very least, I would expect him to be very close to Raikkonen's times in Valencia and probably quicker in later races. It is Felipe Massa, reportedly recovering well from his injuries, who gives us the clue. In Michael's last season in F1, Felipe was getting close to Michael and was occasionally quicker. That should really have warned us that Kimi was not going to have an easy time of it when he joined Ferrari, but the Finn's reputation was sky high then and we believed him to be even faster than Michael. That seems less likely now and, even accepting that Michael may have lost an edge over the years, he should still be good competition for Raikkonen. As for the mechanical and aerodynamic changes that have happened since Michael's departure, I do not believe they will be a serious obstacle for the multiple world champion. He has handled all of them before with the exception of KERS and was always quick to adjust to changing circumstances. acknowledge it has turned into two championships. 2009.5 starts in Valencia and comprises 7 races. Agreed. Schumacher return is risky for his reputation and that's why is a brave decision to make and I also think he will do rather well. ... and about Lauda and Prost, it is true that Prost could have been a more skilled driver, but Lauda had issues all year with the car but when he could finish, he gave Prost a run for his money. I welcome Schumacher's return. It is indeed a brave decision (I hope not foolhardy). He has everything to lose. He certainly is past his prime but maybe for the short duration he will return, it may not matter as much as an entire season. Adreneline may carry him through. I don't see him beating Raikonnen at first but possibly in later races. As for Mansell, don't forget he did win one race in 94. It wasn't a complete debacle. I agree with your Prost observations, he was lucky to have the best car and I think he knew it. I seem to be among the minority who think Schuey won't have lost much of his edge, if at all. He retired when he was at the top of his game, not when he was past it (like some others we could mention, DC I'm looking at you) and I think that once the visor comes down the red mist will be there, same as always. I just can't seem him being there to make up the numbers. He'll go out to win, same as always. I would go so far to say that he would win if the car was up to it, but this is Schuey we are talking about here. He can *make* the car up to it. Curse this summer break ! I applaud him for making the decision to comeback with all the risks to his reputation that it could cause. However I do think that he will find it very tricky as the Ferrari is not the car he left and there are now a number of very good drivers in relatively closely matched cars. I will be interested to see if he manages to win without Brawns tactical help and I will be relishing the battle between Him and Hamilton (who I happen to think is technically a better driver) and of course Kimi who may well want to prove a point. Lets hope he does not turn to his old tactics that he put to use against Hill etc. ehm, how can he loose he's got the best reputation and the worst reputation of them all? reputation ... Schumacher has 7 Ts and is understood to have been the dominator okay thats the plus side. But now the playing field is level (let's hope) the rules have changed and Schumacher is older and maybe knows about his past wrongs. And still, the guy wants to come out punching and give us his best. No matter what he cannot loose at best he does a Lance Armstrong coming in third at worst he wins the title and I have to leave Germany for good OH and Vettel surely would be seen walking in to the Queens embassy in Munich on a damp Sunday morning demanding British citizenship. Hooray for Michael! I mean, really, the guy has nothing to prove...but here he is stepping up to the challenge. Why? I think he feels a certain amount of loyalty to the team and the sport. I don't think ego comes into play here. The guy is obviously a real competitor. The failing circus recall their ageing man-eating tiger as a last ditch attempt to save the show. Sadly, like the Wizard of Oz, the rest have seen behind the curtain, and realize he is not what he pretends to be. The farce continues... If F1 was a fair and credible organization, Ferrari, Ecclestone, Mosley and Schumacher would have been banned for tampering with results that have tarnished the F1 championship for ??? years. Instead we're going backwards. The figurehead of what went wrong is back and how the crooks must be smiling. You aren't alone, Pink Peril. The difference between Michael and the rest of the field is that his absolute passion and drive never left him right up to the time he retired. I doubt it still has, hence his ongoing involvement with Ferrari and motorbikes as opposed to banking or director of German sporting or running an airline. I am still a huge Prost fan but, that return in '93 was just icing on his cake, a big raspberry to Ferrari and really, not his best season. Clive has it right on all counts as far as the comebacks. As far as any risk he's taking, I just don't see it. A few pick up races, even assuming he stalls it on the grid every single start or something like that? How can that possibly wipe out his acheivements? Sorry, those are there to stick for a very, very long time. My own guess is Luca di & Domenicali are still rubbing the bruises they got when Michael twisted their arms back and sat on them and told him who would be driving the F60. No one had to bring him back for the show. He just wants to compete again. And I just want to see him drive again. I'm afraid I agree with you, Nick. Well said. Hats off to you NICK !! Well I am not at all happy that he is back. The teams have been working well together and getting along and now he is back to spread suspicion and his own personal brand of poison. We have a 19 year old kid dropped into a race weekend without ever having turned the steering wheel in an F1 car but as soon as Schumacher appears he wants a special test for safety reasons. Before the teams or abyone else responded he is out at Mugello in a 2007 car on slick tyres rto simulate the behaviour of the 2009 car. He is already breaking rules and we have not reached his first race yet. "Maranello, 4th August 2009 - Guess who opposed the test with the F60? A team that hasn't won anything for years and yet didn't pass over the opportunity to demonstrate once more a lack of spirit of fair play. Just for the record, the Scuderia Ferrari had given its approval to let Alguersuari test, but it seems even in this instance someone decided to stick to the precise wording of the regulations." You would think a team that failed to win a driver's title for 21 years despite having the biggest budget in F1 would think twice about putting the first paragraph out. It is beyond sense that a team that has/had a veto on other team's techonolgy and various other unfair afvantages as the result of their illegal deal with the FIA has any understanding of the spirit of fair play and clearly from their statement they don't. Only Ferrari could put out a statement claiming to be the injured party because someone wants to stick to the rules but I guess when you are used to the rules applying to everyone else and not you that is understandable. 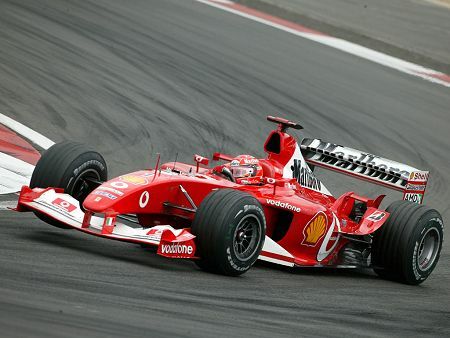 I hope Schumacher's comeback is brief and that he does not do the kind of harm his previous career did to F1.